Today I’m happy to introduce NPD — a phase distortion synth for iPad. It has a clean and streamlined interface that is simple to use. The synth works as an Audio Unit extension (AUv3) inside host applications such as AUM, Auria Pro, Cubasis, GarageBand and NanoStudio. I’ve been working on NPD since September 2017 and I’m very happy to see it complete. This year I’m planning to work on an entire album on iPad and I know I’ll be making heavy use of this synth. I would like to thank all the beta testers for their valuable feedback and the artists who have sent their presets to be included in v1.0. If you have further feedback don’t hesitate to get in touch. Grab the app from the App Store. A quick note on my other AUv3 apps. I’m currently working on bringing some of the UI, DSP and some internal improvements made in NPD over to NFM, and then later on to NS1. Updating NS1 may take a bit longer due to the fact that it’s written in Swift 2.3 and Xcode migration can’t seem to be able to handle migrating the code to the modern syntax very well. But more importantly, NS1 is fully optimised for accessibility. I’m hesitant to break that feature. Having said that, NS1 is a very important app to me, so it will get a proper update at some point. Minor updates for MIDI Sketch and Lyrics View have been pushed to the App Store. Both apps have been optimised for iPhone XS Max, iPhone XR and the new iPad Pro screens. More stuff in the works. I tweeted this last month, but thought I’d capture it in a blog post here. June 29 was my last day at a news giant as an iOS dev. Following Monday, I left Sydney to see where nomadic life might take me. I’d like to see if I can survive without one home for 6 months. After, I’ll decide whether I like being a nomad or it’s time to go back to stability. Besides travelling around the world I’ll have more time to work on the projects I care about. This obviously includes making more music and update my apps regularly. Additionally, I’m keen to get back into ML and generally into AI. The field of AI always interested me as a CompSci student but back then it was AI winter. Having a full time job doesn’t leave much time for experimentation and playing around with my projects. So hoping to get more done. The goal with music has been to make one album a year. I’ve hit that target more or less for the past 5 years. But I would like to increase that to 2-3 a year. This will allow me to experiment with more diverse music styles with each album. Regarding AI, for now, I’m still in learning phase. ML is a very fast evolving field at the moment. So not sure where things will go and if I’ll end up making apps that utilise some of that. As an iOS developer most contracting roles have been around fetching JSON from network and displaying the data in a table view. It gets quite boring after a while. If/when I get back to doing contracting roles I’ll look for jobs that utilise ML and other interesting tech. This is my rough travelling plan. But I will be winging it a lot. Drunk Piano is now streaming on Apple Music, Spotify and SoundCloud. You can download or stream the album from Apple Music, iTunes, Spotify, Beatport and SoundCloud. I posed NFM 1.0.1 update last week with a new preset selector feature, that also works inside host applications. I've been trying to maintain the position that AUv3 host apps should provide their own implementation of preset selectors for uniform user experience. But a few weeks ago I was reminded by one of the NFM users that the user interfaces of preset selectors provided by some hosts aren't that great at the moment. Take GarageBand for example, most people don't know how to switch to the built-in preset selector view. And once you get to it, it's just as unintuitive that you need to swipe the preset selector icon left or right to switch the AU presets quickly. Hence the decision to finally bite the bullet and provide my own implementation of it. NS1 will get that feature as well soon. Also, I've finally completed the NFM User Guide. It is also accessible from within the NFM standalone app. As always, all feedback is welcome. This is version 3 of the popular Lyrics View app. It has been fully rewritten from scratch to support all modern iOS devices. It is used by professional and karaoke singers around the world. The clean and minimal interface lets you focus on the song lyrics played by the iOS music app. Lyrics View can be used in any orientation on iPhone and fully supports iPad multitasking. With the built-in theme picker, you can change the colour scheme, font, text size and alignment for the best experience. You can easily control the music player and queue songs from within the app. Note that the app doesn’t come with any lyrics, nor does it download them from the internet. You need to ensure that your music collection is tagged properly. Lyrics View loads lyrics from the song file tags. You can easily edit them by using the iTunes application on your desktop computer. For more information and any support queries please visit the product website. You can grab the Lyrics View from the App Store. You can download or stream Unresolved from Apple Music, iTunes, Spotify, Beatport and SoundCloud. This update took a while, but it’s finally here. You can grab MIDI Sketch from the App Store. I would like to say big thanks to Louis Smith. He was extremely valuable continually giving me feedback as I was adding accessibility enhancements to NS1. You can grab NS1 from the App Store. If you have any feedback or questions get in touch. Here’s another great demo video of NS1 made by Doug from The Sound Test Room. This time NS1 is running inside GarageBand. I saw a few questions in the comments section of the video and a few people have asked me questions regarding the preset management and Core MIDI. So I thought I would use this post to respond some of those questions/concerns. Some people thought that NS1 doesn’t work with MIDI. Whilst, the standalone app itself doesn’t respond to MIDI message when NS1 is launched as an AU extension inside a host app like AUM, GarageBand or Cubasis it will of course respond to incoming MIDI messages. I imagine most people would want to use NS1 inside a host app. 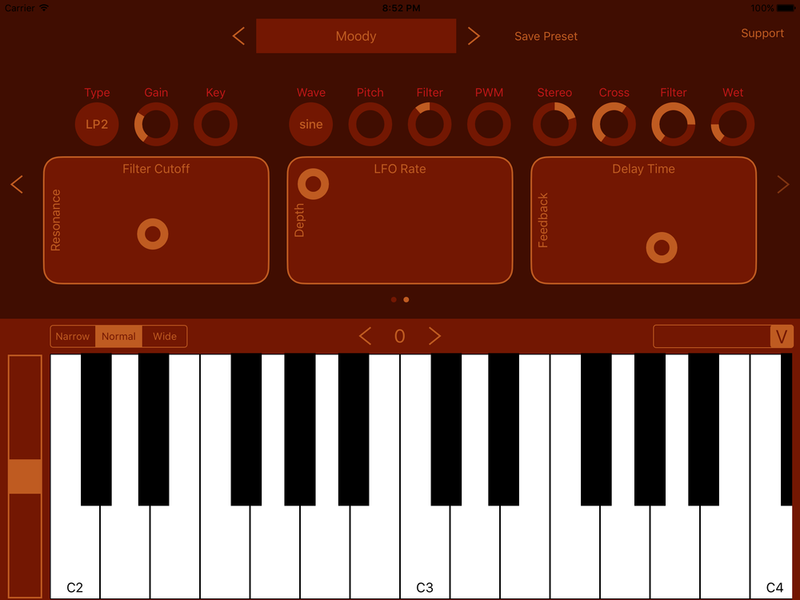 The standalone app itself is intended to be used to demonstrate the synth capabilities and maybe to create some presets. But if a lot of users end up using it in a standalone mode for one reason or another I will consider adding the Core MIDI support there too. The way the presets currently work is that you can launch the standalone NS1 app and make some presets inside it. Next time you launch it inside a host you should see the preset that you created as one of the factory presets. You can try this with AUM and GarageBand. While you are inside these hosts you also have ability to save presets. However, these presets are local to the host and can’t be accessed from the other hosts. This is pretty much iOS limitation. Currently, iOS 9 only allows very limited interaction between a host and an AU when it comes to preset management. The host simply asks AU to provide a flat list of preset names (i.e. no folder structure or any kind of grouping or tagging). Then host can let the user select a preset from this list. The host has no way of telling AU to create and save a new preset to the factory presets. The host can only create its own local ones. Now, some people have asked me to add preset management as part of the AU extension UI. I have 2 issues with this approach. First, AU already has a very limited space to display knobs and sliders for users to play with. I’m not a fan of crammed interfaces. It makes synth programming harder and less inspiring. The second reason is that I believe interacting with presets should be a uniform experience inside a host. Doesn’t matter what AU I load inside a host I want to have the same experience. I’ve filed a radar asking Apple to enhance this capability. Please do the same if you want this feature to be enhanced system wide. You can do that at https://bugreport.apple.com/ and reference the radar I filed: 24714202. We all know what the desktop preset management experience is like. Take Logic or Live for instance, they both have nice left hand library browsers. But a lot of plug-ins provide their own custom preset management UI and the presets don’t even appear in these browsers. I’m not a fan of that to say the least. But I understand why some of the plug-in developers have done it. For instance, some of them wanted to add tagging/grouping capabilities etc. Having said all that, I’m not very stubborn, and if the situation doesn’t improve I’ll add the custom UI for presets to the NS1 extension. Tom Wies from Synth Anatomy created a cool demo video of NS1 running inside Cubasis. 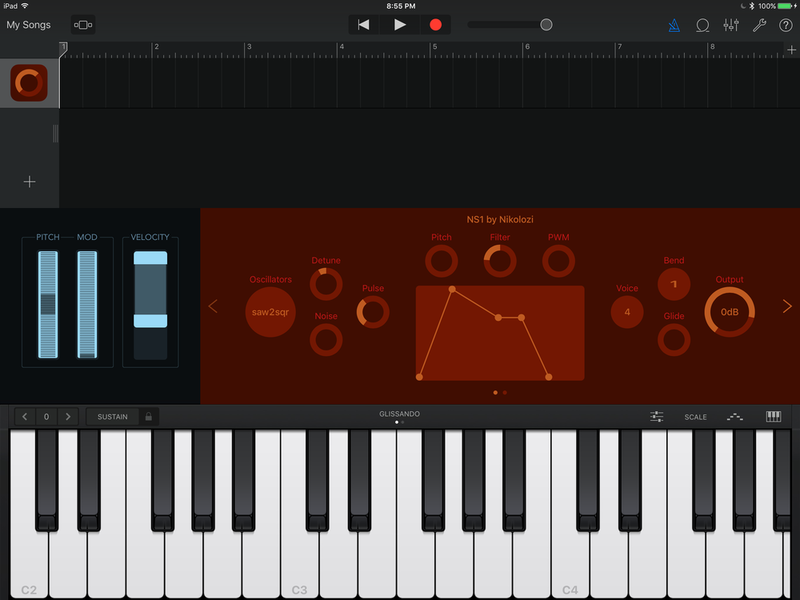 Introducing NS1, a virtual analog subtractive synthesizer audio unit for iOS. This is one of the most exciting apps I’ve ever built, mainly because ever since I got into making electronic music I always wanted build my own synthesizer. They all sounded so cool, but somehow I never got around to properly diving into low level audio programming and digital signal processing. That was the case up until recently. I spent late 2014 and the first half of last year improving my understanding of DSP and how synths are made. And since I believe making music on tablets is the future, I decided to build an Inter-App Audio synth for iPad. By the end of May I was close to finishing it. I just needed to iron out a few issues. But then WWDC happened and Apple introduced Audio Unit extensions. IAA seemed clunky all along and AU extensions technology seemed like something I’ve been wanting for a long time. So, rather than trying to ship NS1 with IAA I decided to abandon the “deprecated” technology and add the AU extensions support. NS1 with AU extensions support was ready in December, but I couldn’t release it as I was still waiting for GarageBand and the other AU hosts to appear so I could ensure compatibility. I expected that there would be a sea of AU extensions and hosts released during the month of October, but iOS 9.0 had a few AU bugs and even Apple didn’t get around to updating GarageBand with AU and iPad Pro support until January. Nevertheless, I’m glad it’s finally here. GB is a great piece of software. Now, here we are. My first synth is out in the wild and I feel proud. My goal with NS1 was to create a synth with a simple, intuitive and clean interface that can produce great sounds. I hope you enjoy using it. You can learn more about the app here or grab it directly from the App Store. I've packaged up all the tracks I created last year into an album. It’s titled ’Lost Seconds’. From Monday you’ll be able to stream it from your favourite music service. I rebranded the MIDI Editor app to MIDI Sketch. Mainly because MIDI editor means slightly different things to different people and they have certain expectations how it should function. My goal has always been the app to be a musical sketchpad. Therefore, I think, MIDI Sketch is a more apt name for it. As part of the rebranding process I updated the icon as well. There will be another update or two coming next few months, but with this first update I wanted to add support for new iOS hardware. 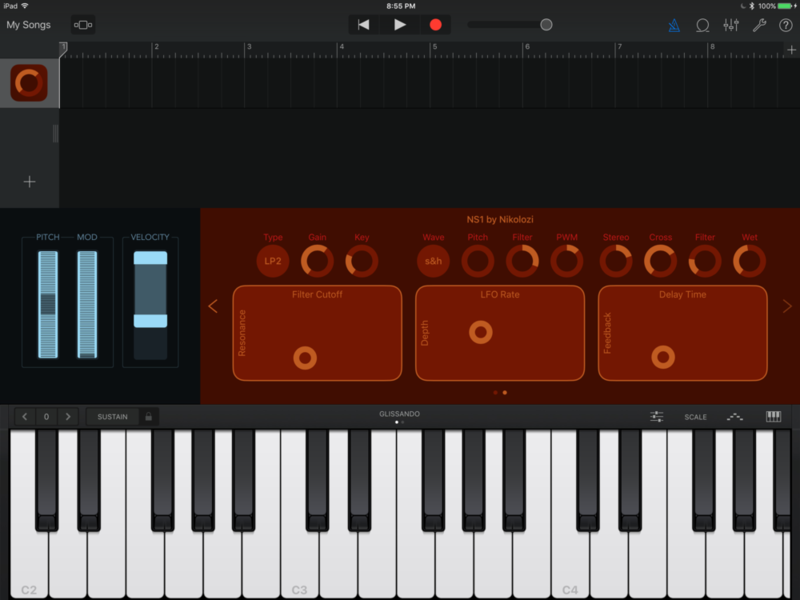 MIDI Sketch now supports bigger iPhone screens and iPad Pro. In addition, I’ve added home screen actions via 3D Touch that work on iPhone 6S and 6S Plus. You’ll be able to create a new clip or open a recent one. Also, I fixed a few bugs that were bothering me a while now. This version requires iOS 9.2 or later. The reason I did this is because iOS 9.0 and 9.1 has a bug were MIDI sequencing API doesn’t work, rendering the app useless. I didn’t want customers on older iOS devices to experience this issue. So, I had to do it. You can grab the app from the App Store. As usual, if you have any feedback don’t hesitate to contact me. Here's my recent musical output. I hope you enjoy.